Michael Kopech just arrived in The Show. Now he'll have to wait in the wings for quite a while before stepping back on the game's biggest stage. MLB.com's No. 13 overall prospect has a torn ulnar collateral ligament in his pitching elbow, the White Sox announced Friday afternoon. The injury likely will require Tommy John surgery and keep the right-hander out for the entire 2019 season. He's expected to get a second opinion on whether he needs the procedure. "It's been a whirlwind of emotions for me in the past couple of weeks, obviously," Kopech told MLB.com. "From just about my absolute peak to the absolute rock bottom for me. I think to say it's unexpected would be an understatement." Kopech was promoted to the Major Leagues on Aug. 21 and made four starts for Chicago, posting a 5.02 ERA with 15 strikeouts and two walks over 14 1/3 innings. Prior to his big league debut, he spent the entire season with Triple-A Charlotte, where he was 7-7 with a 3.70 ERA, 1.27 WHIP and 170 strikeouts over 126 1/3 innings in 24 starts. "If you are looking for a specific pitch or day, I couldn't tell you. It's been gradual," he said. "I just thought it was a little bit of discomfort. I thought it was something I could throw through. "I just kind of assumed after every start it was soreness and then some starts I thought it might be a little more sore than others. I just didn't ever put it in the category of pain. I put it in the category of soreness. I wouldn't be able to pinpoint a time." Beyond the dominant strikeout numbers, the 22-year-old right-hander had turned a corner of late in the control department, which had been the biggest knock on his prospect profile. The No. 2 White Sox prospect posted a 1.84 ERA with 59 strikeouts and only four walks over his final seven starts (44 innings) in the International League. He had averaged 6.1 walks per nine innings in 17 outings prior to that stretch. Drafted 33rd overall by the Red Sox in 2014 before being traded in the Chris Sale deal in December 2016, Kopech became widely known for his elite velocity. The 6-foot-3, 205-pound hurler routinely touched triple digits and averaged 95.7 mph with his fastball during his brief stay in the Majors. He also possesses an above-average slider and an average changeup to round out his profile. 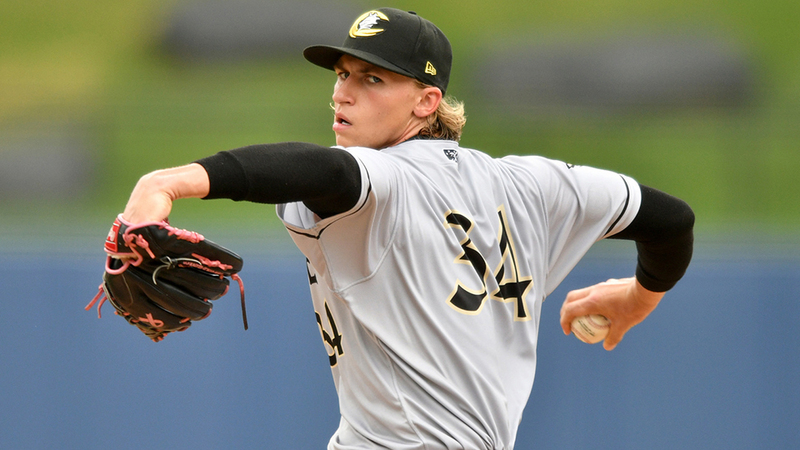 Kopech is one of seven White Sox prospects ranked among MLB.com's top 100 and, along with former Charlotte teammate Eloy Jimenez, was expected to be a big part of Chicago's move from a rebuilding club to a contending one, beginning in 2019. Instead, he joins Brent Honeywell, Hunter Greene and A.J. Puk as top 100 prospects who suffered serious elbow injuries this year. Sixth-ranked White Sox prospect Dane Dunning has been out since late June with a moderate right elbow sprain that the team said wouldn't require surgery.